So, who else was obsessed with stars in the 90s? Oh right... everyone. I was really into making bracelets as a kid (uh, and teenager) and I remember my favorite beads were those glow-in-the-dark star beads. You knew I REALLY liked you if your bracelet had one of those. I still have a handful of them stashed away in my "special box". I told you... I'm a saver. You know my 90s-loving heart fell hard for this dress. I couldn't even help myself. It's a little on the shorter side for this lady, so I tucked a soft and stretchy skirt underneath. Problem solver I am. I hope you all are having a lovely week so far! I TOTALLY REMEMBER those glow in the dark hearts! I think I still have some too in a box of beads somewhere in my basement! Just adorable. I love the top. Oh that dress is perfect (as are you). Also, I'm lusting over your locks so much! that dress is so beautiful! and you make it happen as always! i found your blog a while ago, and you are just amaaazing!! i have no idea how old are you and i'm not interested in it though. you always look so girly and lovely and still a bit naughty :) i wish i would be such a mother like you are, when i have kids. Oh, the 90's... I definitely had those glow in the dark stars tacked up all over my bedroom! Oh, girl. I have a picture from 9th grade of me with a star choker and white eyeliner. We also wore those foil stars next to our eyes. We were awesome. That dress is super cute and I love you hair scarf! wow that is short haha... still so lovely! I was too young in the 90s... don't remember a thing. A few weeks back you were wearing a pair of Levi's and you told me they were 535 jeggings but thick enough to be jeans. Well, I stumbled across a pair at a thrift shop for $8 and they fit like a dream! Thanks so much for telling me what they were! Love this outfit! your hair is perfect! And yes, I often wear skirts under my dresses for modesty's sake. I've been following your blog for quite some time now, but I've never left a commet before. I love your style! Classy classic yet a touch of personality!!! YOU ARE SO STINKIN' CUTE!! Long live the 90's! never thought to put a skirt under a dress to lengthen it. Such a great idea!! I'm 5'10" - i run into the wayyyy too short dress problem often. Thank you for the great idea! I pinned this outfit because I think it's GENIUS!!! So many cute dresses are just a bit too short, this is the perfect solution!!!! 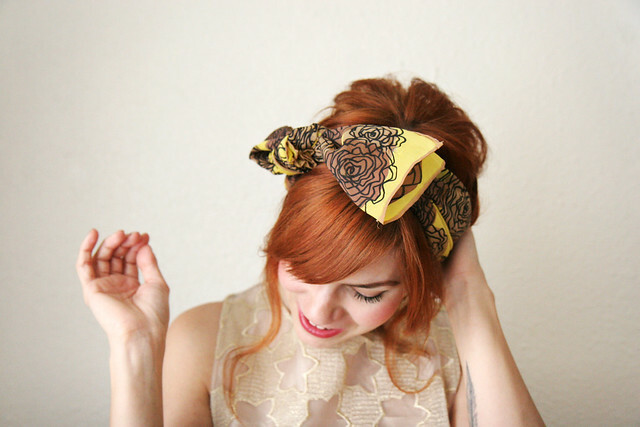 I'm dying over that head scarf, ADORABLE! & gorgeous outfit & lady as always. Loves glow in the dark star beads! Still do, actually! Love it! I hear you about stars! There was this musician called Miss Angie and on her first album cover she wore stars on the corners of her eyes. I totally channeled her when I was in 9th grade. I used those metallic ones teachers use for sticker charts! Everyone thought I was weird. I thought I was so cool. True story. Um, love this. AND my name is Star so that just makes it even better! you're so pretty! i am a sucker for redheads and you are the walking image of vintage beauty. you should do a tutorial on that hairstyle!